An Overview of Pilon FracturesI’m Ed Smith, a Sacramento Personal Injury Lawyer. Many people have suffered a fracture at some point in their life and those that haven't likely know somebody who has. In the world of fractures, they can range from small, hairline fractures to those that are particularly severe, similar to car crashes. One of the rarer fractures is called a Pilon fracture; however, these can have significant long-term consequences for those who befall them.Definition of a Pilon FractureThe world of bone fractures is wide and varied. These traumatic injuries can happen anywhere from the skull all the way down the femur and into the feet. 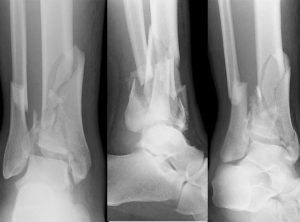 A pilon fracture is a fracture that involves both the leg and the ankle. The tibia and fibula articulate with the ankle to form a flexible joint. It is important for this articulation to be flexible so that people can not only flex or extend but also roll their ankle from side to side when necessary. The ankle is an important structure because this flexibility helps to absorb the shock that comes with walking, running or sudden changes in direction. A pilon fracture is a fracture of this articulation surface. This fracture takes place at the end of the tibia near where it joins the ankle. The size of the fracture can range widely with the severity of the injury but people may feel a crack or a pop. There could be swelling at the location and the individual will likely have difficulty walking. This is an unusual fracture; however, they often occur with serious accidents and a recent literature review explored the causes of this injury in greater detail.A Literature Review: How do they Happen?Because pilon fractures are relatively rare, there hasn't been a significant amount of medical research performed on them. To help alleviate this gap in knowledge about this injury, some medical people collected information on all of the pilon fractures they could find. They took a look at not only the records at their own hospital but also turned to the medical literature to try and find any case reports that they could. They found that there are a couple of common ways that these injuries occur. Examples include:Auto Accidents: One of the most common ways that people sustain these fractures is in an auto accident. Sometimes, people's vehicles can be struck in the side by another car or truck. When this happens, some could have their foot pinned and rotated at the front of the car. It could feel trapped between the door and the floor. This rotational force can stretch and crack the tibia, leading to a pilon fracture.Sports Injuries: These rotational forces can be seen in other settings as well. In many sports, people need to plant their leg and rapidly change directions. If someone gets their cleat stuck in the ground, they could twist their leg, placing rotational forces on the tibia and causing a pilon fracture.Falls from Height: Another way that people sustain these fractures is through a fall from a large height. As someone falls from a rooftop or second story, their foot strikes the ground. The forces from the ground are transmitted up through foot into the ankle articular surface, leading to a pilon fracture.Long-Term Consequences of a Pilon FractureWhen someone sustains a pilon fracture, they need to have it examined by a medical professional. Often, these serious injuries require surgery to repair the break. There could be plates and screws involved in the repair process. It is important to evaluate and repair this fracture as quickly as possible. Failure to do so can lead to damage between the end of the tibia and the top of the ankle at the articular surface. This damage can erode some of the cartilage in the area, leading to arthritis that could develop sooner rather than later. This can have serious impacts on someone's ability to walk, run, or even move their ankle. This could even prevent someone from moving around the house, performing activities of daily living. For this reason, it is vital for people to have their ankle evaluated and repaired as quickly as possible.Help from a Legal ProfessionalFor those who experience long-term consequences as a result of their injury, they should know that there are people available who can lend a helping hand. There are not only friends and neighbors around but also legal professionals who would like to assist people in their time of need. A consultation with an experienced personal injury attorney can help somebody review all of the options available to them when it comes to filling out paperwork, investigating the circumstances of an auto accident, filing health insurance claims, or dealing with the loss of property. Do not be nervous or hesitant about asking for help because everyone falls on hard times occasionally. A medical injury is no different.Contact an Experienced Sacramento Personal Injury LawyerI’m Ed Smith, a Sacramento Personal Injury Lawyer. People who have trouble walking after a serious traumatic accident should feel free to call my office for some free, friendly advice. Our phone number is 916.921.6400 and our toll-free line is (800) 404-5400.Member of the Million Dollar Advocates Forum.Please look over my verdicts and settlements here.Check out Avvo, Yelp, and Google to read reviews from some of my past clients.